I’ve prepared a turkey on the grill in about every way possible. For the absolute best turkey, I’ve realized it’s not just a single technique, but a combination. 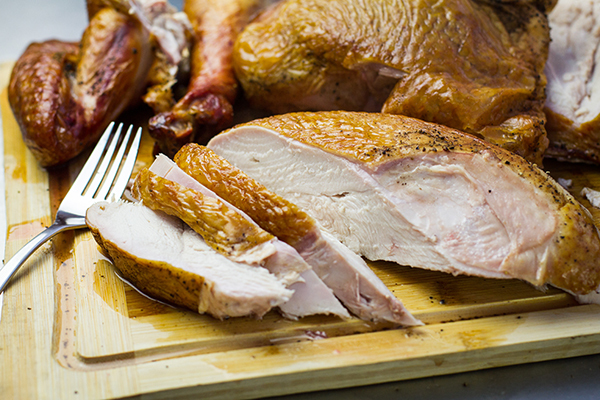 A spatchcocked turkey is fantastic for even and fast cooking. By removing the backbone, the turkey is grilled flat, increasing the surface area of exposed meat thus speeding up the grilling time. While yielding fantastic results on its own, I find smoking the bird at a lower temperature makes it even better. 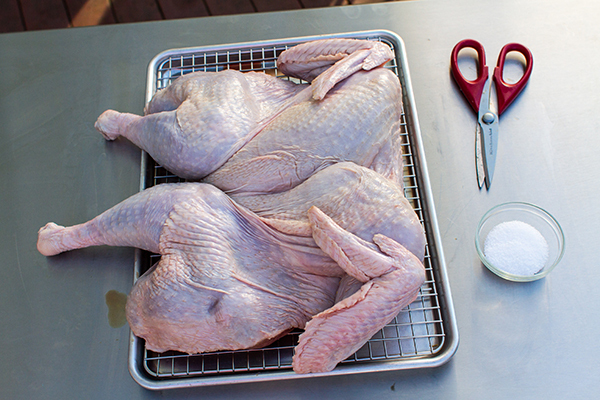 Add in an overnight dry brine and you have the makings of a Thanksgiving turkey never to be forgotten! 1. 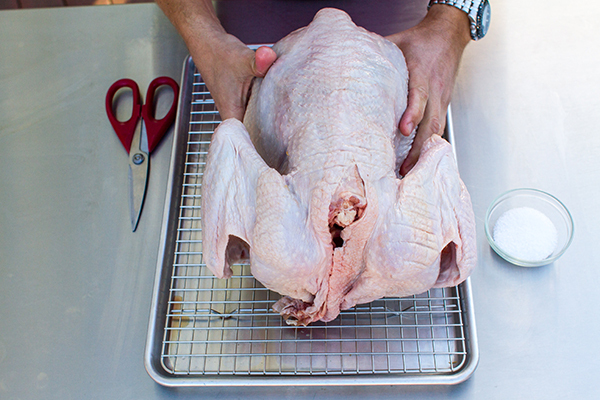 Remove the neck and giblets from the turkey. 2. 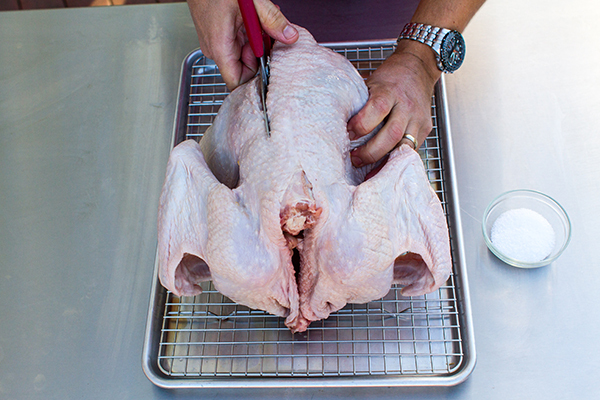 Place the turkey breast side down on a solid work surface. 3. With kitchen shears, cut along both sides of the backbone and then remove it. 4. Place the turkey flesh side down. 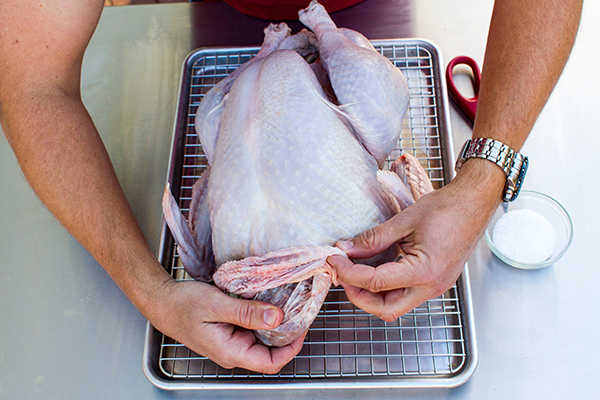 With both hands, press down on the breast to snap the breast bone allowing the turkey to lie flat. 5. On a wire rack, salt both sides of the turkey. 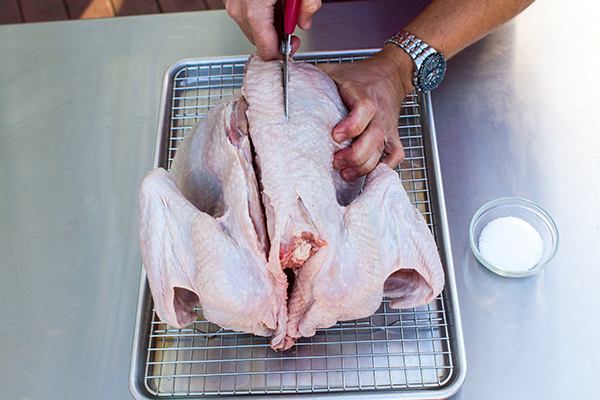 Figure approximately ½ teaspoon per pound of turkey. Place the turkey in the refrigerator, uncovered, for 24 hours. 6. Prepare the grill for smoking. 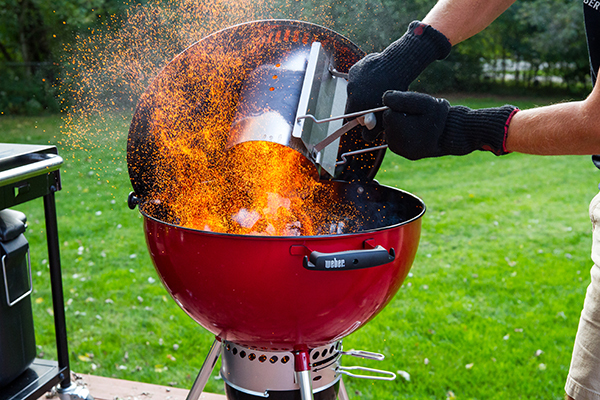 Once the Weber Briquettes are lit and the grill temperature is between 225°-275, add several chunks of apple wood on top of the charcoal. 7. Insert the iGrill temperature probe into one of the turkey breasts. Keep the probe in the thickest part of the breast being sure not to strike bone. 8. 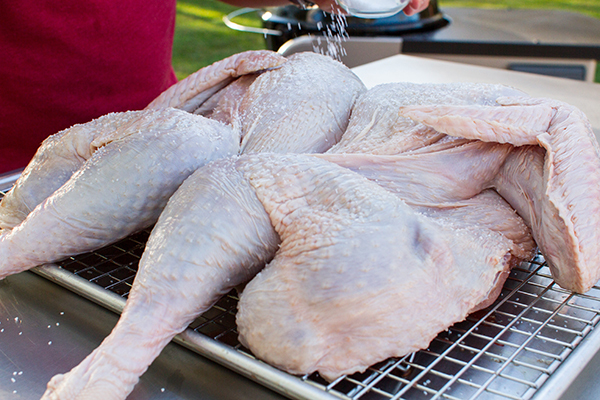 Smoke the turkey over low heat 225° - 275° F for approximately 11-13 minutes a pound. 9. 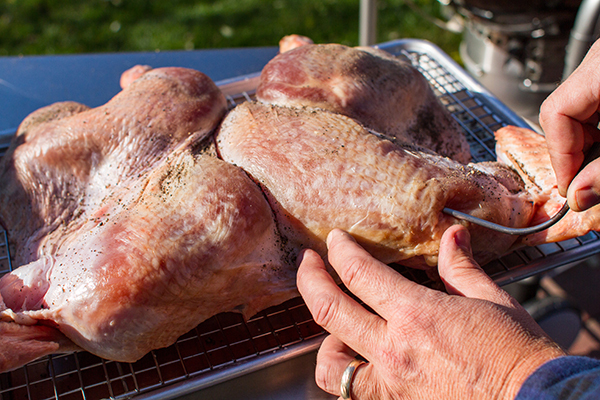 Once the breast reaches 165°F, remove, cover loosely with foil, and allow to rest approximately 30 minutes. 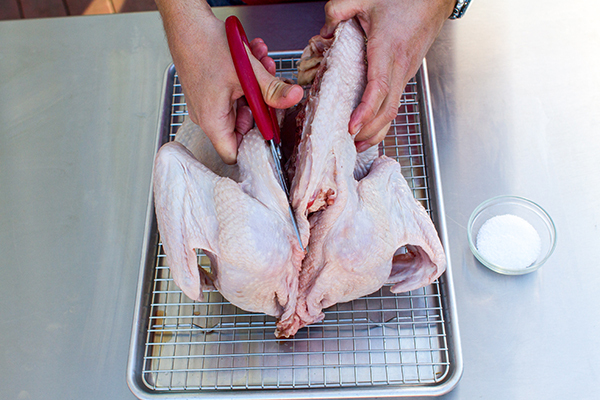 Looking for more great turkey tips? 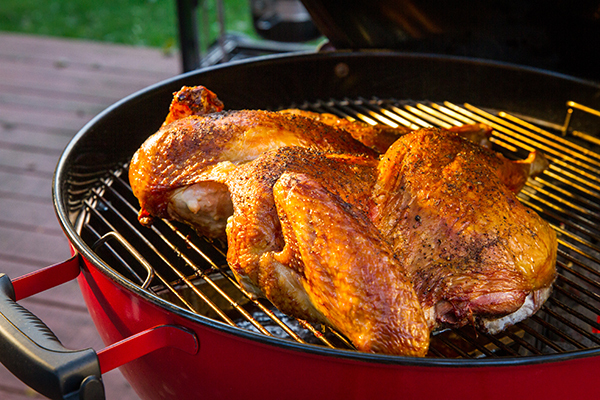 Check out how many minutes per pound your turkey will take to grill and our top tips for the best turkey ever!